That my friends, is a quick pic, of just one area of my almost, fully organized, redone studio room… not quite complete, but getting there! 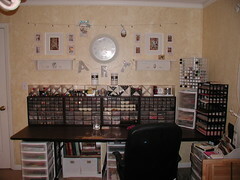 That is where I’ve been… I’ve been cleaning out, and reorganizing both my art studio, and my e-bay room. Once I re-open the store, I won’t get a chance like this again – so I utilized it! You’ve all heard me talk about how these things hanging over my head the last few years, has bogged me down.. well I did something about it! I feel instantly lighter! Talk about a way to lose 50 pounds instantly! Over the next few weeks, I’ll begin blogging regularly again, and highlight different areas of the room, and talk about the ideas I used within my studio – I can’t begin to tell you what peace of mind it has brought to me, and it’s my wish… that maybe it will help some of you as well. Now, I’m off to finish what I can of it … and then tackle backing up my computer… It’s dying, and is only giving me a few minutes of usage at a time…so if I vanish again, It’s prolly cause of that! Many hugs, Miss you all! Good for you! I know how yuo feel. There is nothing like decluttering for giving one a lighter feeling. It also frees up creativity, so watch out! Thanks for the inspiration! I envy you actually getting things going. I loose steam so quickly and then move on to something else before I accomplish any studio cleaning. Quick question – where did you find the diagonal containers you use for your markers, etc? They look wonderful! Looks wonderful! I can’t wait for the play-by-play. Chrysti…good to see you back again :o) Can’t wait to see more pics of your room…maybe i can get some organization ideas from them as my room is a total disaster. Nice to see you posting again…if you ever get the bug to organize…put me at the top of your list! Errrmmmm……re the “Quantity Discounts and tons of coupons are available” reference for Office Depot….the link to? Looks like that doesn’t /provide/ available coupons – (ie, I clicked to get the $10 off $50 one)…..but rather a place to /enter/ coupon codes you’ve received with promotional mailings from O.D. That’d be a nice discount on some of the ‘X’ cubes etc, but without it….kinda spendy. How does one get the prerequisite promotional offer?!?!? !